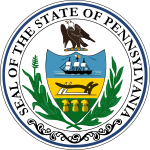 Pennsylvania elected its members October 13, 1818. Joseph Hopkinson Federalist 1814 Incumbent retired. Plural district with 2 seats Levi Pawling Federalist 1816 Incumbent lost re-election. Isaac Darlington Federalist 1816 Incumbent retired. John Whiteside Democratic-Republican 1814 Incumbent lost re-election. Pennsylvania 4 Jacob Spangler Democratic-Republican 1816 Incumbent resigned April 20, 1818. William Maclay Democratic-Republican 1814 Incumbent retired. Plural district with 2 seats Samuel D. Ingham Democratic-Republican 1818 (Special) Incumbent resigned July 6, 1818. Thomas J. Rogers Democratic-Republican 1818 (Special) Incumbent re-elected. Pennsylvania 8 Alexander Ogle Democratic-Republican 1816 Incumbent retired. Plural district with 2 seats William Wilson Democratic-Republican 1814 Incumbent retired. John Murray Democratic-Republican 1817 (Special) Incumbent re-elected. ^ Based on incomplete data. ^ Cox, Harold (January 31, 2007). "U. S. Congressional Election 13 October 1818" (PDF). The Wilkes University Election Statistics Project. Wilkes University.